James, say hello to Felicity. (Hello!) Felicity, say hello to James. (Hello James) James say goodbye to Felicity. Woman talk (smacks James on the hind end). Its a pretty effective tool and its something I try use in general life: how would I feel if it were reversed? How would I react, is it just or reasonable still? This did actually get men to stop and reconsider their behavior and attitudes, because they hadn't ever thought it through before. They were just behaving how everyone did and didn't consider it at all. This is one of those ideas that seems great in the planning room while surrounded by like-thinking folks but in practice is at best really tacky and insulting. The presumption that all men are rapists is standard among the really angry feminist crowd, but extending that to official college campus equipment is nearly criminal. And of course, there's the whole shirt fiasco. A scientist is lead on a team of engineers and designers that managed to land a craft on top of a comet to test it out - a truly astonishing feat of engineering - and what happens? His Hawaiian shirt is attacked by the bitter, humorless left. Now, apply the principle above to this. How would the women react if a woman did something this amazing and world-class in science, and the guys in the audience... fixated on her clothing? This is such an obvious, no-brainer its hard to imagine how someone could possibly not think through more carefully but again, sometimes you can get locked so much into a culture you don't even have the beginning tools to consider what you're doing. So isolated, so surrounded by like-thinking people who reinforce your worldview that it never occurs to you to question what you say or do. These are the same sort of women that hounded Chancellor Summers from Harvard for daring to suggest that maybe there are fewer women in sciences and math because... brace yourselves... maybe fewer women are interested in these fields? Inconceivable! Everyone that works in an office knows that women can hang shirtless hunky men in their cubical but men cannot put anything remotely resembling a beautiful woman up without being attacked for objectifying women, creating a hostile workplace, and facing potential dismissal and at best going through sensitivity training designed to crush individuality and enforce a certain leftist ideology. 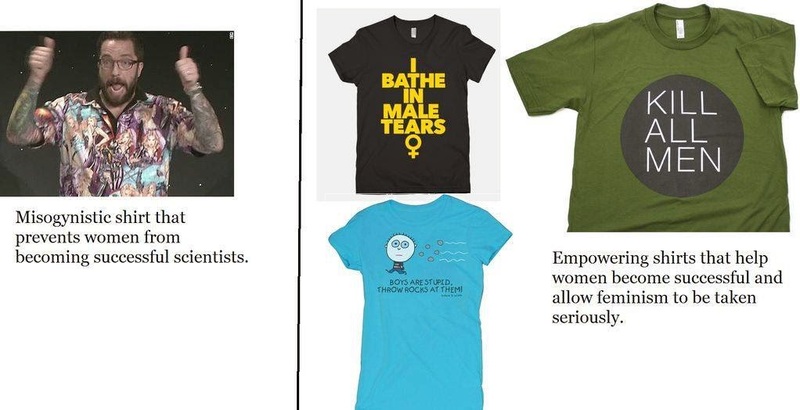 The truth is, the feminists involved in this fiasco that crushed the engineer's spirit so badly he was weeping openly on camera apologizing for wearing a celebratory shirt a woman made for him are not very popular these days. Feminism in general has waned in power and influence largely because they accomplished their goals. When your movement wins, people tend to pat you on the back and move on. And this group of unpleasant sorts represents a very unattractive side of the left these days; the kind of people who want to restrict your drink sizes, change your child's lunches, take candy out of their hands, prevent you from doing anything fun at all because its potentially harmful/sexist/bigoted/bad for the environment etc. People use words such as "puritanical" and there's some historical validity to this claim, but the truth is, these sorts of people have always been with us, and shift from political or religious group to another without regard to the group. They aren't about the religion, they are about control and power. They are about making everyone else do what they wish and stop doing what they don't like. These are the book burners, the witch dunkers, the people who ban trans fats in restaurants, the kind of people who ban smoking in bars and demand first base coaches wear helmets in baseball like a retarded kid who you're afraid will bash his head. And almost all of them these days are on the left, because that's where the power is. That's where they have the greatest ability to enforce their will on others. They know best, you are inferior and stupid and wrong. And these kind of people should never, ever be given the power to implement their will, because in the end it always leads down the road to Katyn Forest, The Killing Fields, The Disappeared, and Auschwitz. Katyn Force? Forest I think. Well said otherwise. You know, when you have a degre in women's studies you ahev basically gotten yourself a useless piece of paper, who's only value is to make you unhappy with life. Yeah not sure how that ended up Force rather than Forest. I fixed it.